Compile any genealogy information you have into a working chart printed by Family ChartMasters and let attendees grab a pencil to update the chart directly with family updates of new births, marriages, and deaths. This is a great ice breaker or time filler before the real festivities begin! Our new "My Ancestor: Family Reunion" e-book includes carefully selected activities to bridge the gaps between generations, families, and individuals. These are not generic group activities, but rather purposeful games and experiences which teach and educate family members about their present and past roots. With over nearly 70 suggestions to choose from, your attendees will have fun, enjoy a little competition, and even put their technology skills to good use with social media, blogs, and other online resources. Print the activity workbook pages and distribute as desired during your family reunion to explore your family history with fun and games! 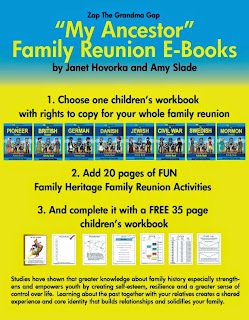 This e-book, available as an immediate download, has over 80 activity pages specifically written to engage children with their parents, grandparents, aunts, uncles, cousins, and siblings at the family reunion. As they strengthen modern family bonds, they will strengthening their link to the past. Click here to order now to use at your upcoming family reunion and we'll get it send right out to you. This an e-book and will be sent electronically as a PDF, so it's perfect for last minute planning!